In a recent research study, barbers were able to provide blood pressure checks and heart healthy information to their clients. After six months, test results showed great improvements in their clients’ blood pressures. 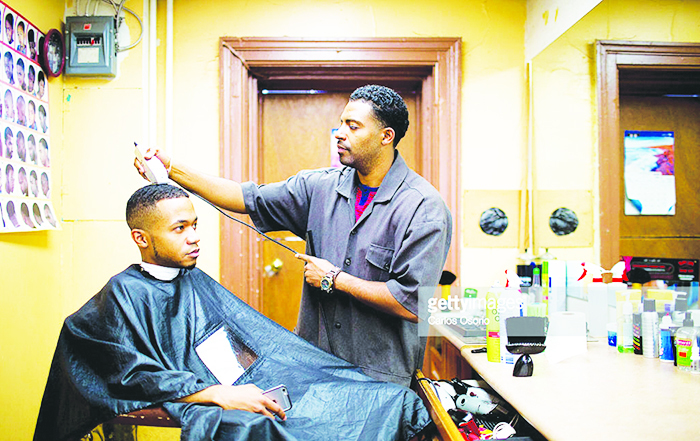 It has long been known that barber shops hold a very special place in the heart of the African American community. They are a place where Black men gather, talk and are treated with respect. There is comfort there, trust is there and guards may be let down. In the mist of living everyday life, the barber shop can be a wonderful resource that provides a caring environment for African American men. It is no secret that African American men have the least lifespan of any group in America. It is also no secret that hypertension and cardiovascular disease are two reasons for the early demise for African American men. In a stunning study presented at a recent cardiology conference, it was shown that Barbers and Pharmacists were cutting edge in giving medical care. The study involved taking two groups of African American men who frequent barber shops. One group had their blood pressures taken by their barber and were also provided with information on lifestyle changes. I would imagine such changes would include diet, exercise, and making sure these men took their medications regularly. The other group of men got their blood pressures taken by their barber, received information on lifestyle changes and also received advice from a pharmacist regarding their medications. This pharmacist was able to prescribe medication to the barber shop clients. They used a prescribed plan and no physicians saw these patients. Most of the men in this group, being well trimmed, were seen by their barbers every two weeks and simultaneously had their blood pressures measured and recorded. This study lasted for six months. The results were stunning. The men in the group being monitored and given advice had a decrease in their blood pressures on average of nine points. That is a wonderful drop that can change the cardiovascular health of a man. Often, it would take one or two medications to do what the advice from a barber did for the cardiovascular health of these men. The second group of men who saw the pharmacist experienced a 21 point drop in their blood pressures (on average). Such a drop is indeed lifesaving. The investigators are also analyzing whether this method saved money for these men and the health care system. I cannot see how it would not have financial benefits. Again, our community institutions, such as our barber shops have value in many more ways than just making our men look good. They have the power to help extend their lives. I support training our barbers to provide this type of care to their clients. Any takers?